Over the last two weeks, the U.S. has imported a record amount of Ecuadorian oil, leading to speculation that a deal or pay-off may have been made to ensure Moreno’s cooperation with Washington’s long-standing efforts to have Assange arrested and extradited. Speaking in Madrid on Friday, Ecuadorian President Lenin Moreno told an audience that WikiLeaks founder and editor-in-chief Julian Assange would need to leave Ecuador’s London embassy “eventually.” Moreno offered no time-table for Assange’s possible exit, which several sources just last week asserted could take place within “weeks” or even “days.” Assange has spent over six years in the embassy after being granted political asylum by Ecuador in 2012. However, Moreno asserted that Assange’s “departure [from the embassy] should come about through dialogue.” He went on to state that “for a person to stay confined like that for so long is tantamount to a human rights violation” and affirmed his commitment to reach a resolution to Assange’s situation that did not “pose a danger” to the journalist’s life. Thus, Moreno’s concern for the WikiLeaks editor’s “human rights” might easily be mistaken for an attempt to deflect recent criticism that has accused him of acquiescing to U.S. demands that Ecuador revoke Assange’s asylum and evict him from the embassy. Indeed, the U.S. has sought Assange’s extradition from the U.K. to the United States to face charges of espionage and treason for years, and this very effort was the impetus behind Assange’s receipt of asylum in Ecuador’s London embassy. 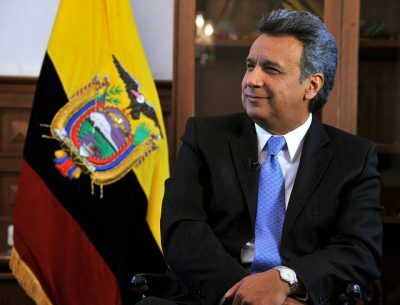 Moreno’s recent statements continue to add to the speculation that Ecuador will soon give in to those U.S. demands, particularly given the increasing pressure the Trump administration has placed on Ecuador regarding Assange’s situation. According to some reports, the U.S. has threatened to block an International Monetary Fund loan to Ecuador over the Assange case. In addition, over the last two weeks, the U.S. has imported a record amount of Ecuadorian oil, leading to speculation that a deal or pay-off may have been made to ensure Moreno’s cooperation with Washington’s long-standing efforts to have Assange arrested and extradited. If Moreno does give in to U.S. demands, he will be rejecting not only his nation’s sovereignty but also the rights of all Ecuadorian citizens, given that Assange became a citizen of Ecuador this past January. Were Assange anyone else, the Ecuadorian government would be forced to act to remedy his situation and protect him from extradition in order to, at the very least, maintain appearances. However, Assange is no “normal” individual in this sense: his arrest is a “priority” to the U.S. government, which is now seeking to maximize pressure to extradite Assange while his protected status is at its weakest.